* Annual estimated passenger usage based on sales of tickets in stated financial year(s) which end or originate at Guildford from Office of Rail and Road statistics. Methodology may vary year on year. Guildford railway station is at one of three main railway junctions on the Portsmouth Direct Line and serves the town of Guildford in Surrey, England. It is 30.3 miles (48 km) from London Waterloo. It provides an interchange station for two other railway lines: the North Downs Line northwards towards Reading, which has a connection to Aldershot; the same line eastwards to Redhill; and the New Guildford Line, the alternative route to Waterloo, via Cobham or Epsom. Guildford station is the larger, more frequently and more diversely served of the two stations in Guildford town centre, the other being London Road (Guildford), on the New Guildford Line however its London services operator is the same. The station was opened by the London and South Western Railway (LSWR) on 5 May 1845, but was substantially enlarged and rebuilt in 1880. The Reading, Guildford and Reigate Railway opened its services on 4 July 1849, and was operated by the South Eastern Railway. 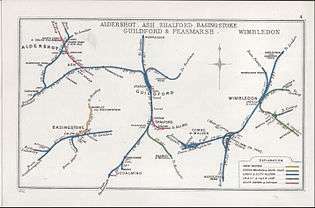 LSWR services to Farnham via Tongham began on 8 October 1849 and the New Guildford Line to Leatherhead and Epsom Downs on 2 February 1885. On the latter line is the other Guildford station: London Road: the line to it describes a curve around the town on an embankment, crossing the River Wey by a high bridge. 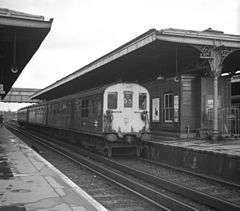 Guildford station was also the northern terminus of the (now-closed) Cranleigh Line of the London Brighton and South Coast Railway, which opened 2 October 1865 and closed almost one hundred years later on 12 June 1965. This line ran to Horsham by way of Cranleigh, Rudgwick and Christ's Hospital. On 8 November 1952, an electric multiple unit suffered a brake malfunction approaching the station. It overran signals and collided with a stationary steam locomotive. Two people were killed and 37 were injured. On 28 July 1971, a parcels train was derailed at the station. Looking towards the west from platform 2. Platforms 6 and 7 serve the same single line. An ex-Network SouthEast EMU operated by South West Trains at Guilford station in 2000. The main station buildings are on the Down side. At the end of the Down side platform is a bay for the New Guildford Line. There are now three islands with seven platform faces plus the bay linked by both a long footbridge and a subway. Platforms 6 and 7 are opposite sides of the same line: these were used for unloading mail and parcels until the mid-1990s. The station was completely rebuilt (except for the platforms) by British Rail in the late 1980s. Platforms 6 and 7 are on opposite sides of the same single line. Automatic train doors only open on the platform 6 side. Today doors are not opened on platform 7 due to the live rail being on that side, hence rendering that platform disused. Platform 6 is signalled for bi-directional working – trains may approach from either direction. Guildford station was the site of an important motive power depot opened by the LSWR in 1845. The original building was demolished in 1887 to make room for the enlargement of the station, and was replaced by a semi-roundhouse which was substantially enlarged in 1897. This was closed and demolished in 1967. The Farnham Road multi-storey car park was built on the site in the 1990s. Guildford station was to have been the southern terminus for the proposed Heathrow Airtrack rail service. The project, promoted by BAA, envisaged the construction of a spur from the Waterloo to Reading Line to Heathrow Airport, creating direct rail links from the airport to Guildford, Waterloo, Woking and Reading. Airtrack was planned to open in 2015, subject to government approval. In April 2011, BAA announced that it was abandoning the project, citing the unavailability of government subsidy and other priorities for Heathrow, such as linking to Crossrail and HS2. The station is served by services operated by Great Western Railway from Reading to Gatwick Airport and South West Trains from London Waterloo to Portsmouth Harbour, Waterloo to Guildford via Cobham or Epsom and Ascot to Guildford via Aldershot. Occasional CrossCountry trains to Newcastle and Southern services on the Sutton and Mole Valley route towards West Croydon and London Bridge also call. Southern Region steam in 1965 in Guildford. 4Cig in 1980 in Guildford. 2 trains per day to London Victoria via Sutton and Norbury. One morning and one evening service both to and from London Victoria. 1 train per day to London Bridge via Sutton and Forest Hill. One morning service to and from London Bridge. 1 train per day which terminates at Sutton in the evening peak. ↑ "Cranleigh Railway website". 2007-04-23. ↑ Moody, G. T. (1979) . Southern Electric 1909–1979 (Fifth ed.). Shepperton: Ian Allan Ltd. p. 122. ISBN 0 7110 0924 4. ↑ Earnshaw, Alan (1991). Trains in Trouble: Vol. 7. Penryn: Atlantic Books. p. 44. ISBN 0-906899-50-8. ↑ Griffiths, Roger and Smith, Paul (1999). The directory of British engine sheds and principal locomotive servicing points: 1. 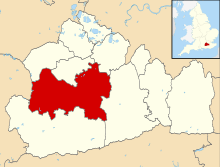 Southern england, the midlands, East Anglia and Wales. Oxford: Oxford Publishing Company. p. 77. ISBN 0-86093-542-6. ↑ "Heathrow Airtrack". BAA. Retrieved 6 January 2010. ↑ "Heathrow Airtrack Waterloo rail link shelved by BAA". BBC News London. 11 April 2011. Retrieved 11 April 2011. ↑ Samuel, A. (11 April 2011). "Heathrow: 'No option but to withdraw proposed Airtrack link to Staines'". Rail News from Rail.co. Retrieved 11 April 2011.